These hogs have been out on pasture since July 4th. 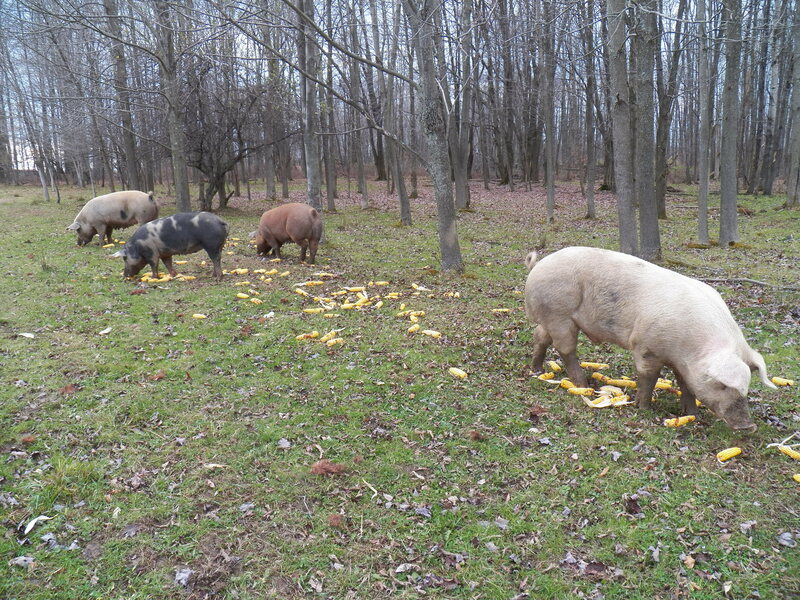 They get supplemented with ear corn, but forage for much of their food. It is no accident that they are in this good condition. I grow red clover and fescue pasture for them. I look after them and nature provides a bounty of nuts and wild apples. I also supplement their feed when needed. The stock is fattened by the eye of the master. These hogs are, like me, very content. They are not bored. They are not standing in manure or swill. The mud on them is usually because they choose to put it there. They make wallows to cool themselves. They push up leaves and brush to create a warm bed. They snuggle together and slumber. They do root a little, but the damage is usually done to quack grass roots that I want to eradicate anyway! I think about my livestock often. It is my job to keep them safe and fed. I choose to raise them in a stress free environment. I know that, living with minimal stress is better for all of us. I do many repetitive things. I feed at the same time. I use the same gates. I call the pigs different than the horses. Each specie knows when I am calling them, the rest barely look up. I am resistant to change, much more enjoying the status quo. I prefer the order of things. If the axe must fall, it is done humanely. I don’t talk about it for weeks, stir up a rumor mill or threaten the animals with the phrase, “You might be next.”. I do what needs done swiftly. I don’t put on a show and I comfort those left behind. There are many lessons to be learned on a good farm. I am glad to have learned, listened and watched, but most of all I am glad to have this haven to call home. It truly is what it means to be … Living the good life!